and the winner is… laci! i’ll email with some choices for striping kits. 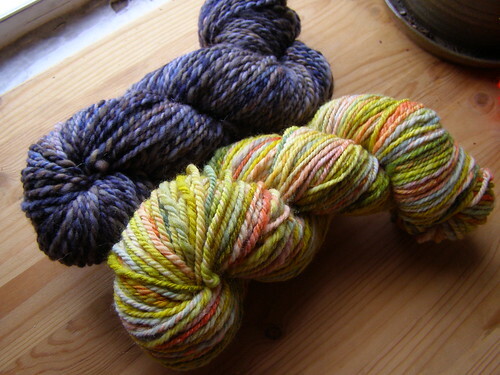 and the first two yarns off of the matchless. yay! p.s. it appears i may have been over analyzing this whole fiber club thing… but thanks to all for the input! i’ll have more info on it within the week. 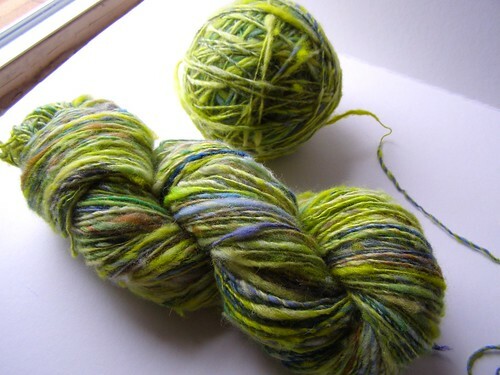 This entry was posted in cosyknitsliterally, cosyspins, handspun, spinning by cosymakes. Bookmark the permalink. The green thick and thin is so great! thanks! as you can tell, i couldn’t resist it and started knitting with it right away! I finally got a free minute to spin up the Subtle Stripes… Oh my wow! I think falkland is my new favorite fiber. It is very lovely. It is drying now and I can not wait to knit it. Thanks so much. It is very yummy fiber. yay! so glad you like it. beware that it plumps beyond all else when washed too. i can look at it and think – worsted and it will want to be knit on a size 10 needle!